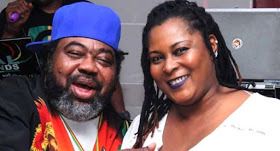 Three months after the death of the reggae icon Ras Kimono, his wife, Efe, also died. He died late at night, around 3:00 a.m. while she was being transferred to the hospital. Efe had attended a family function yesterday and it was fine, before she started complaining of discomfort. Before her death, she actively participated in her husband's funeral ceremony and in other activities related to the farewell of the icon. Her death comes three months after the death of her husband, who died in June.